“I’m not sure what I just saw” is what I posted on Facebook. The sight of people standing in clear plastic bubbles, like some kind of artist happening was enough for me to stop the car on my way home and take a closer look. I walked over to the park where a few others were gathering, interested silently watching. What was this? All kinds of theories were running through my head. 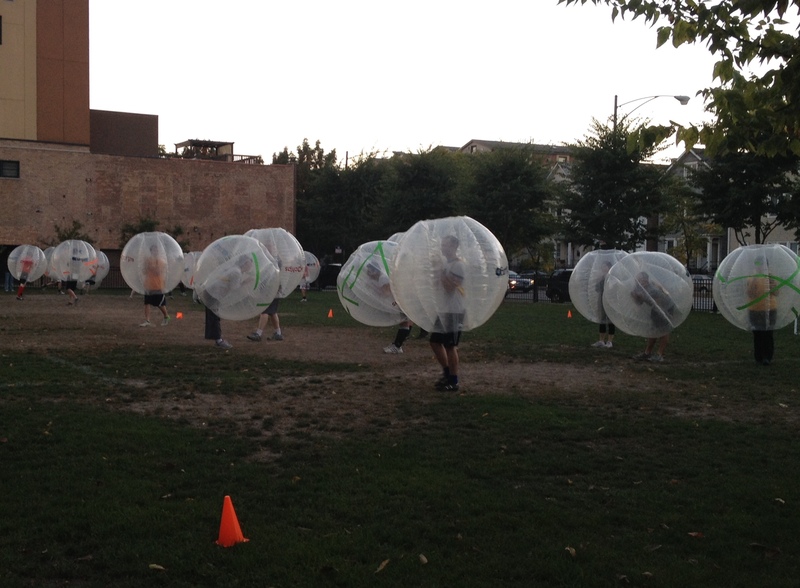 It’s some kind of eccentric Chicago-Lincoln-Park-Group, or some kind of Mom-Exercise-Post-Baby class, or some kind of Special-Needs-Athlectic-Bumpers or Boys-In-The-Bubble for real. Most of the Bubble People were just standing in place, with arms scrunched in a clear bubble tube, legs hanging out. Some bending over, some walking around like little leaguers in the outfield. They looked lost. No laughter or comments from the bystanders, so I was cautious to even pull out my phone to take pictures. One Bubble tried to kick a soccer ball. It did not go well. Tiny nets were placed everywhere for them to kick the ball into – like a little soccer set for my kids with orange cones everywhere. After one kick, a guy fell down and he looked like a bug trying to get off his back to right himself. It was funny, but again no laughter. So at this point I’m thinking it’s some kind of serious activity for kids with special athletic needs. There was plenty of infrastructure around, plastic deflated bubbles on the sidelines, people responsible for blowing them up with a large air machine. People helping with the Bubbles, getting them on and off. It was not a small operation. I didn’t want to ask anyone around me, so I looked it up when I got home. Here’s a great explanation, from Paul Biasco of DNAinfo Chicago. I was watching the beginning of Bubble Soccer in Chicago. It’s a new league. I’m laughing now.